From time to time even those who have already created hundreds of tattoos or covered their bodies with paintings and inscriptions may run out of ideas. 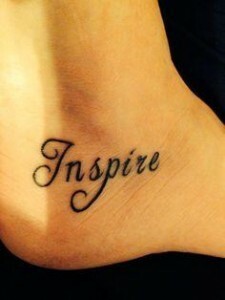 This is where a tattoo-lover needs to find some new source of inspiration. It doesn’t matter if you are searching for a completely new design or trying to complete your work with last and most important detail, which will make it a masterpiece. There are several ways to awake the imagination. Try to remember the style and expression of your favorite artists. Resurrect in mind every brush stroke and color combination, and then think which of their works match with your personality most of all. Maybe a masterpiece is worth perpetuating on your skin. Where else can one find such a marvelous diversity of shapes and forms if not in our mother nature? Every nature phenomenon, plant or animal symbolizes some kind of our feelings and emotions. Dig deeper and you`ll find out that the world has limitless solutions to all your inspiration needs. There are so many types of living creatures whose primal enchantment will make you fall in love and share a part of your body with them. Have you ever noticed that spending too much time working on one sketch may result in an unnecessarily complex design, which is even difficult to perceive from the side. The latest trend in tattooing is minimalism. Go back to the origins of shapes and create something simple but charming. You will see that excess details make the image overloaded. The message you are trying to send to the world with your tattoo will become clearer as you focus on the meaning, not the rendering. What can be a better source of inspiration than something or someone most adorable in the whole world? Call to remembrance all the precious moments of your life and choose the one that should take its place on your skin. Think over, what symbolizes your love for a person or a memory. Better if is it an image, not an inscription, because image is more likely to be filled with emotion. A good tattoo artist will help to interpret dead-hearted letters into a sketch storing your feelings and memories. When creating a work of art one may have difficulties with transforming human expressions and emotions into a graphic reflection of countless thoughts. Don’t lose heart and look deep into your soul. A spark of inspiration is always inside, you just need to kindle the flame!